"This fragrant, creamy soup is a wonderful way to warm up during the holidays. Fresh herbs mildly complement the flavor of pumpkin. 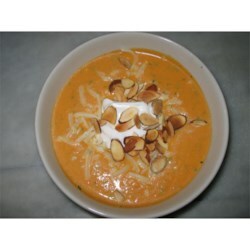 Mozzarella cheese is melted throughout, and toasted almonds add a pleasant crunch." In a large saucepan, mix the pumpkin, vegetable broth, heavy cream, garlic powder and onion powder. Bring to a boil. Stir in the pasta. Cook 12 minutes, or until pasta is tender but firm. Reduce heat to simmer. Stir in pumpkin pie spice, parsley and cilantro. Slowly stir butter, plain yogurt and sour cream into the mixture, making sure they do not curdle. Stir in the cheese, allowing it to melt. Serve topped with nuts. This creamy pumpkin soup is a fall favorite. Delicious and rich, this delightful fall flavor soup was a wonderful way to round out our holiday dinner! Way too bland! I was left with way too much nasty soup. I really upped the amount of spices because of other's reviews, but it still didn't help. I should have listened to the others. Soup was good, but was not as savory as I thought it would be. Seemed a bit bland rather than savory and creamy. I made this soup for the guests at my annual Octoberfest and it was a big hit. Most people were leary about eating Pumpkin Soup, but after trying it, they all asked for the recipe.